Vrapper acts as a wrapper for Eclipse text editors to provide a Vim-like input scheme for moving around and editing text. Unlike other plugins which embed Vim in Eclipse, Vrapper imitates the behaviour of Vim while still using whatever editor you have opened in the workbench. The goal is to have the comfort and ease which comes with the different modes, complex commands and count/operator/motion combinations which are the key features behind editing with Vim, while preserving the powerful features of the different Eclipse text editors, like code generation and refactoring. Vrapper tries to offer Eclipse users the best of both worlds. By adding the following code below to your website you will be able to add an install button for Vrapper (Vim). I had the same problem. I guess at that point of time, the current version that supports 2018-12 and 2019-03 wasn't available on the marketplace yet. Today I was able to install vrapper in 2019-03. I've tried quite a few vim emulators. This is hands down the best of those I've tried; that includes well regarded products like JetBrain IdeaVim. I'd say this plugin is 99% of the way to supporting everything you'd conceivably want in Vim when using it inside an editor. It even supports several popular vim plugins. When I compare Eclipse to other IDEs, it's become one of the major pros. It's also free and OSS; the maintainers are extremely friendly and responsive, and fixed a bug I reported almost instantly. Great product! It seems that the O key, that should change the direction of a selection while in visual block mode (like it does in visual line mode) is not doing so. Is that a bug or there is a option to enable it? The plugin works great for everything else I tried. Thanks a lot. I don't think you'll get a notification that I'm responding so many months later, but this feature is now included in the latest unstable build and will be in our stable version 0.62.0. It looks like this was an oversight, we never implemented the 'o' command in visual block mode. I've filed a feature request for it. it' doesn't work with either "set expandtab" or " set insert spaces for tabs in eclipse preferences". Vrapper only receives key presses if Eclipse does not have something bound to that key. 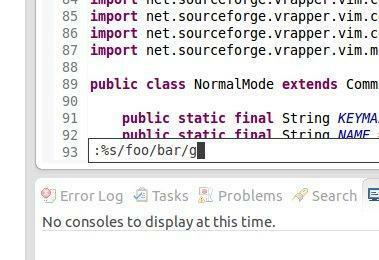 You must unbind "Ctrl+V" from Eclipse for Vrapper to receive it. Go to Window -> Preferences -> General -> Keys and search for "Ctrl+V". Select the binding for Paste and click "Unbind Command". Hit 'OK' and Ctrl+V should now enter Visual Block mode in Vrapper. I confirmed that this still works using the latest unstable build on Luna. If you're having issues with 0.44.0, try upgrading to the latest unstable build and please let us know if you're still seeing an issue. If there can be a way to move cursor between splits with some hotkey combination, (like the vim 'ww'), it would be great! You can ignore my previous comment about accessing this plugin from our unstable update site. The Split Editor plugin is now included in our stable release of Vrapper 0.34.0. HY Xin, we've been working on implementing this feature and put the current state on our Unstable update site. If you add our unstable update site to Eclipse you'll see an optional "Split Editor Plugin" which should give you the commands you want. We made this a separate plugin because it uses the Eclipse 4 API and we don't want to force our Eclipse 3.x users to upgrade. The feature might not be fully stable yet so let us know if you run into any defects! Thanks! Love it to my guts. I have noticed that it terribly slows down some activities in IDE. when I hit Ctrl-F it takes cca. 2-4sec before search dialog appears. after uninstallation Ctrl-F is fast immediate again. why do you need cntrl F when you have installed Vim. I have been testing this for a while now and so far I am really happy with the plugin.